The explosion took place following a coded telephone call to a Belfast newsroom and came despite a ring of checkpoints set up by the PSNI to prevent such an attack. The caller said he represented Oglaigh na hEireann, the breakaway IRA armed group which has adopted the Gaelic name for the IRA. 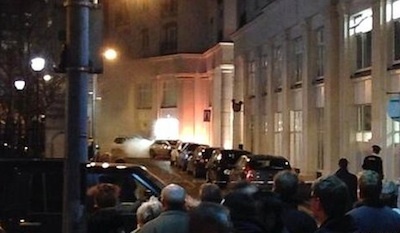 The bomb exploded at Exchange Street West in a busy commercial area near St Anne’s Square. The area had been cleared and members of the public were able to look on from behind a police cordon as the small explosion took place. The explosion was similar in size to one which took place late last month. On that occasion, a larger device partially exploded inside a car parked between a PSNI base and a shopping centre. Earlier this week, more than 300 checkpoints were established by the PSNI around the city centre in an attempt to create a Baghdad-style ‘secure zone’. On Tuesday, a major bomb alert close to nearby Donegall Square was eventually described as an elaborate hoax, but succeeded in closing a busy shopping area for about three hours. The increase in armed actions is taking place amid as negotiations between the Stormont political parties and US diplomat Richard Haass on issues such as parades, flags and symbols, and the legacy of the conflict, are reaching a climax. British Direct Ruler Theresa Villiers described the latest incidents as “absolutely deplorable” and blamed the breakaway IRA groups. “This small minority want to drain the economic life from Belfast - but we will not let them succeed,” she said. Sinn Fein’s Gerry Kelly also condemned the attack. “This indiscriminate and reckless action was an attack on all the people of Belfast and those that had come into the city centre to shop or enjoy the build up to the festive holidays,” he said. In north Belfast, two separate gun attacks on PSNI patrols in the past eight days have also recalled the darker days of the conflict. A makeshift platform was used last Thursday to launch a carefully planned urban guerrilla attack on a convoy of armoured PSNI vehicles in north Belfast. The PSNI later said a military issue Kalashnikov-style automatic weapon had been found nearby. The following night in west Belfast, Volunteers opened fire just before midnight and twice struck a PSNI Land Rover. Although Oglaigh na hEireann has said it was behind both bomb incidents, no organisation has yet claimed responsibility for the gun attacks.